Waters Edge - Dock. Hot Tub. 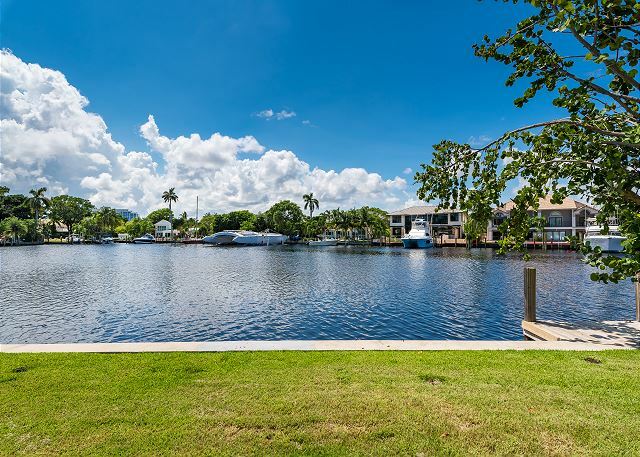 Waterviews.Walk to Beach. Pet Friendly. 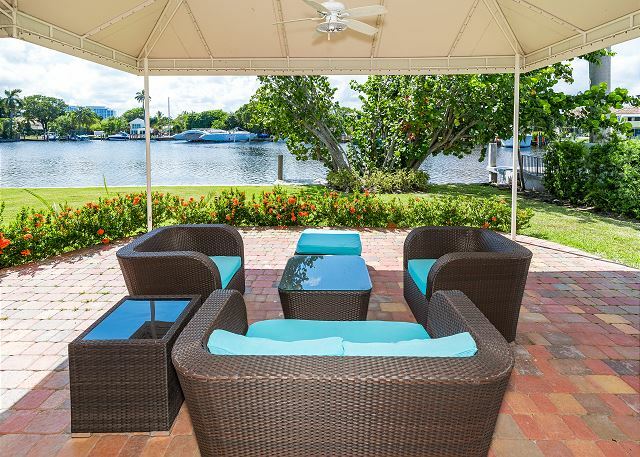 Enjoy a tropical drink with friends in your outdoor seating area that sits five. 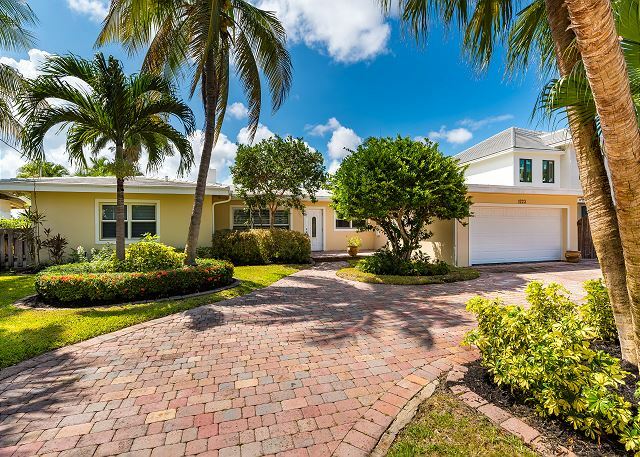 Lushly landscaped ranch-style home accommodates two vehicles in the garage and two on the driveway. Park your boat at the 11' dock after a day sailing up the New River. 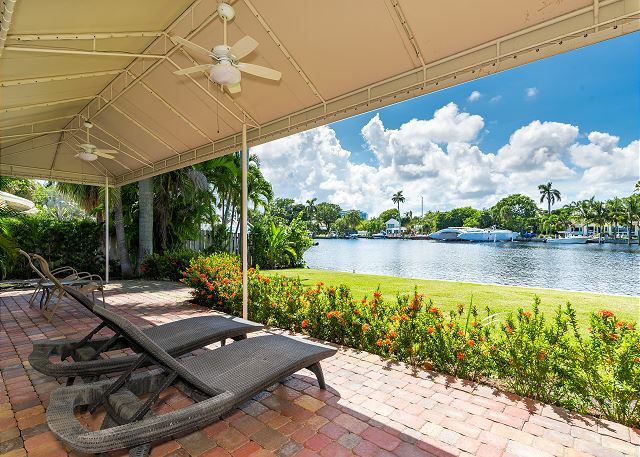 Spectacular water views are seen from most rooms in the vacation rental home. 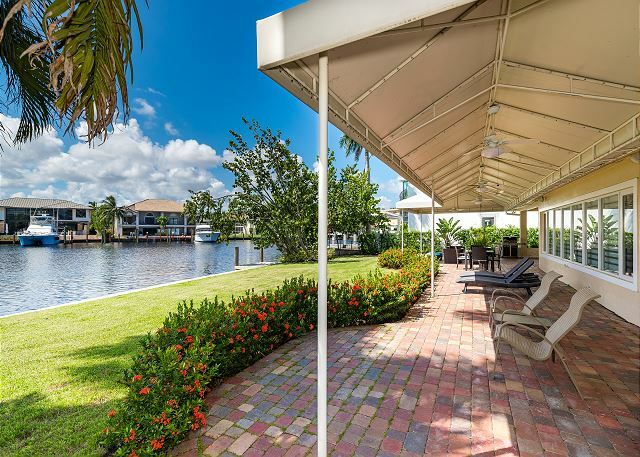 Perfectly nested between the lake and the Waterway, the beach is just across the bridge. Located in Coral Ridge and just two blocks across the street to the Galleria Mall. 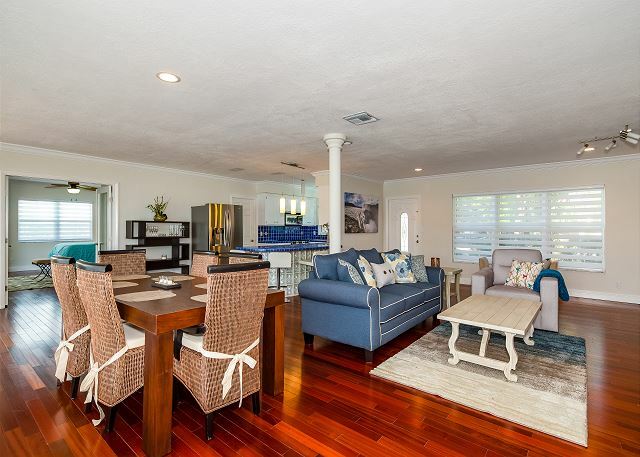 The open floor plan is ideal when entertaining small or large gatherings. The solid wood table is large enough to sit six people. 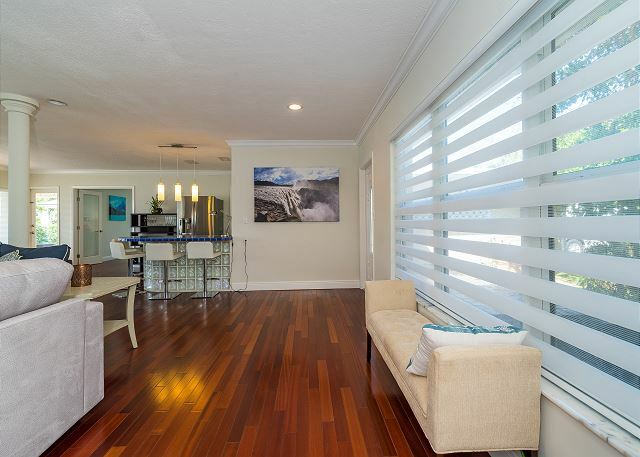 The beautiful floors are imported solid cherry wood and are throughout the home. The new lounger is big and comfortable for watching movies on the 50" flat TV screen above the fireplace. For extra guests, the sofa sleeper folds out to easily sleep two people. 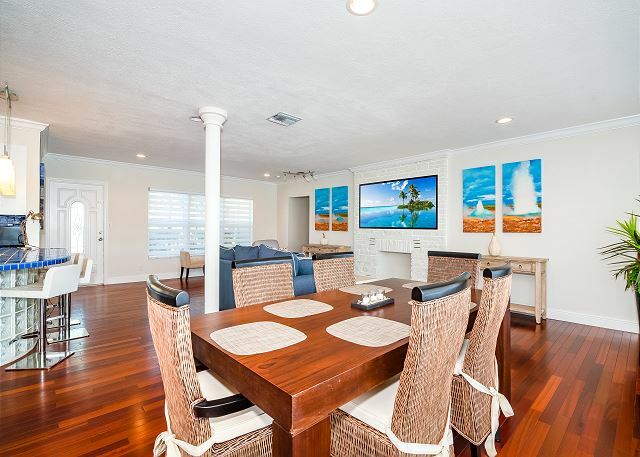 If you're preparing a formal or casual meal, the dining and living area are spacious for your guests to enjoy. The breakfast bar is large enough to sit four when grabbing a quick breakfast before heading out. 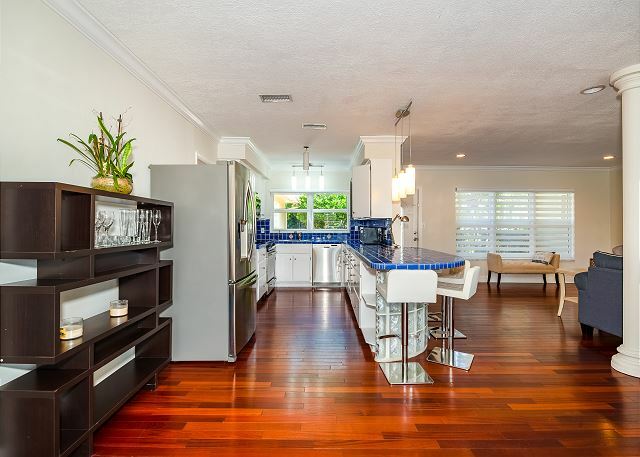 The kitchen conveniently sits in the middle of the main living area and is the center focal point. Stainless steel appliances are modern and make cooking easy for any meal. The oversize washer and dryer are off the kitchen with plenty of counter top and storage space. 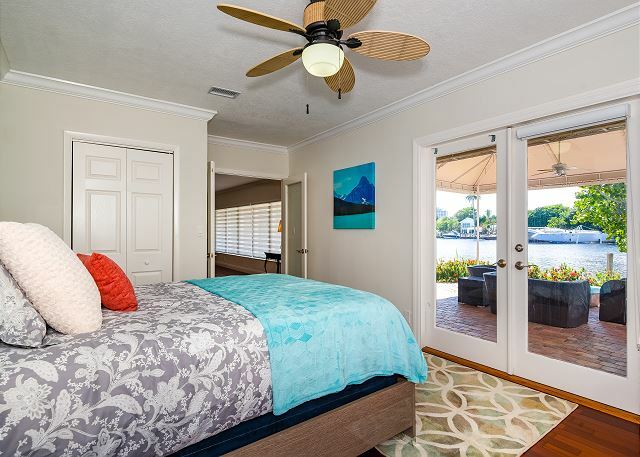 The master bedroom suite overlooks the water and has a new queen size mattress. 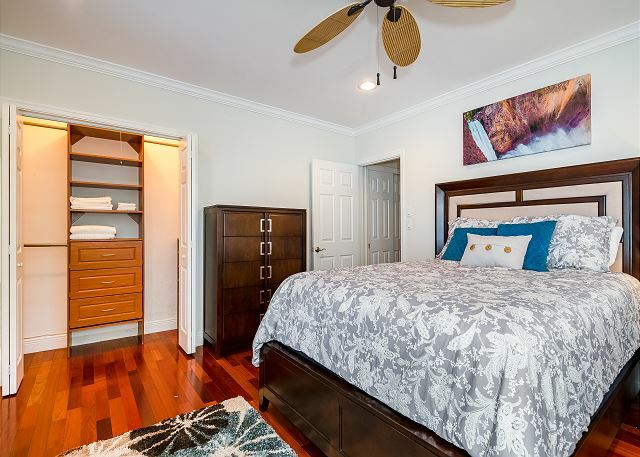 There is plenty of drawers and closet space in the master bedroom. The master en-suite has an elegant pedestal sink and enclosed glass shower area. The second guest bedroom is a private junior master suite with its own en-suite marble bathroom. Off the main living area, the junior master suite has a large walk-in closet for your clothes and luggage. .The junior master suite has glass french doors overlooking the sparkling water. The marble en-suite is for the master junior suite is private and convenient. 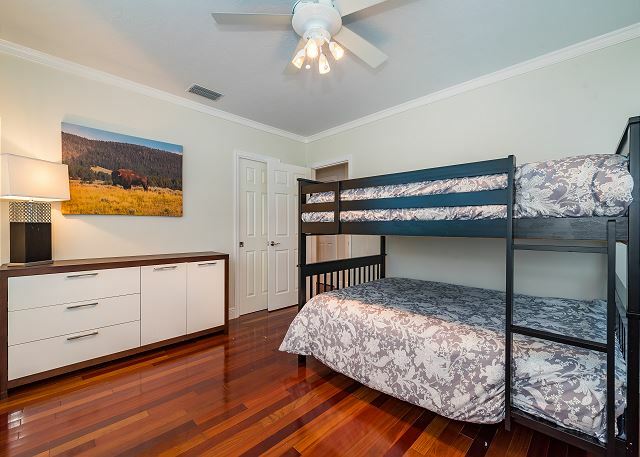 Bunk beds are in the third guest bedroom which sleeps four easily on the two full size beds. 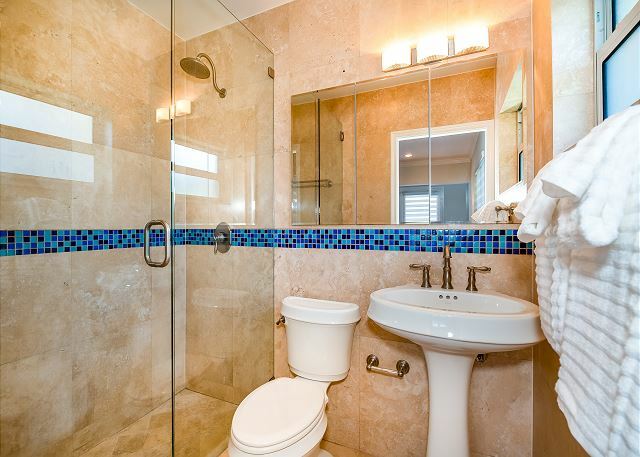 The third marble bathroom in the hallway is easily accessible from the living room. 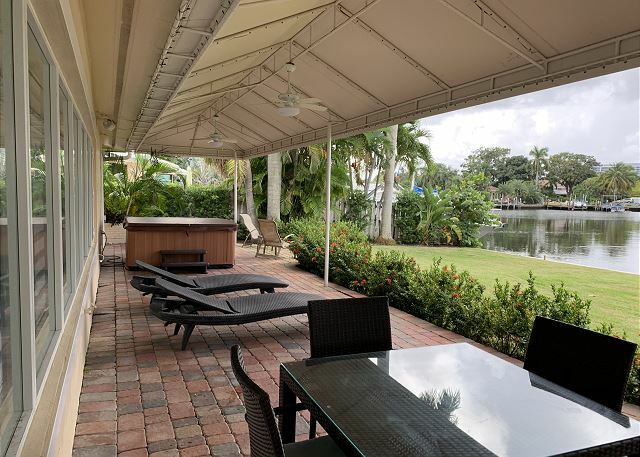 Large hot tub sits under the covered patio and overlooks the wide waterway. Hot tub is perfect for relaxing after a full day at the beach across the bridge. 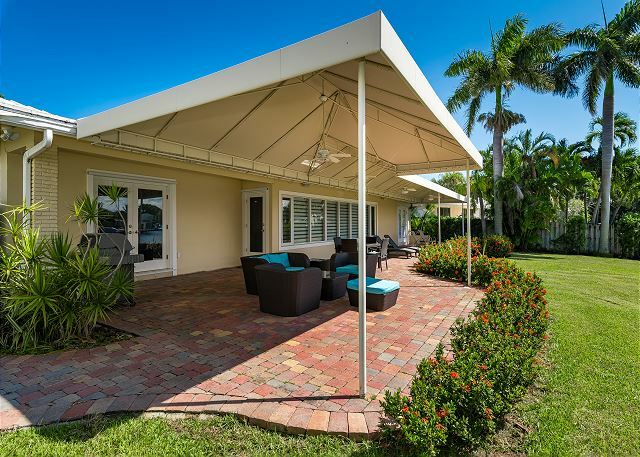 Rest under a large shady canopy top and patio deck area. 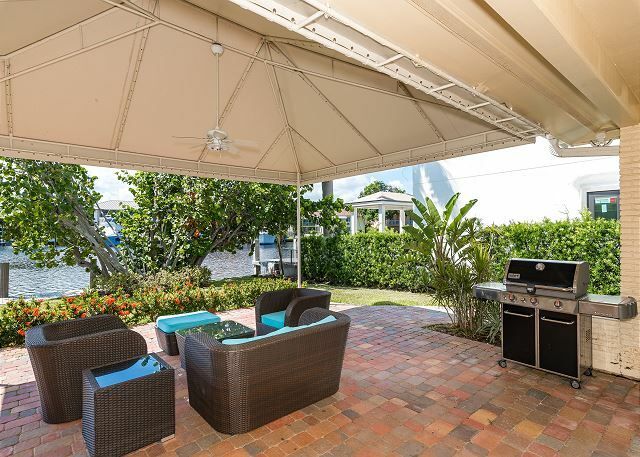 Grill your favorite steak or fish on the BBQ right outside your back door. Enjoy your breakfast with coffee while sitting outside on your table for four. Take a nap after a long sunny day swimming in the ocean just three minutes away. 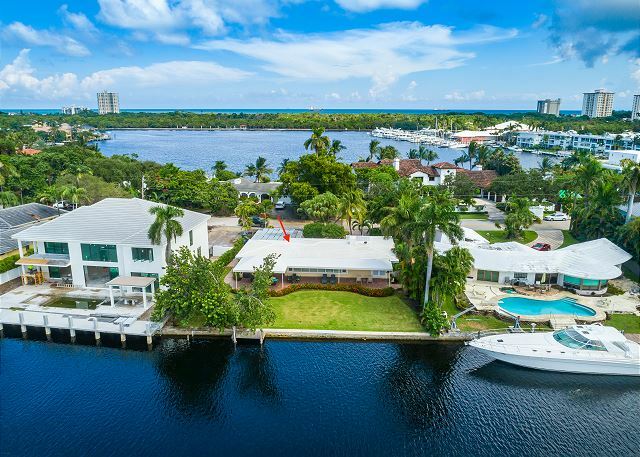 Gaze out over the water and watch the mega yachts sail by. Work on your tan and lay out in the sun on any one of the loungers. 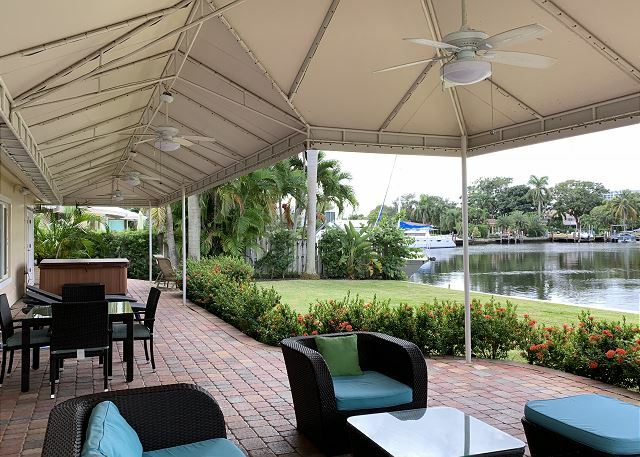 Take in the ocean breeze and enjoy your patio area at any time day or night. Play a game of soccer with the family in the large back yard area. 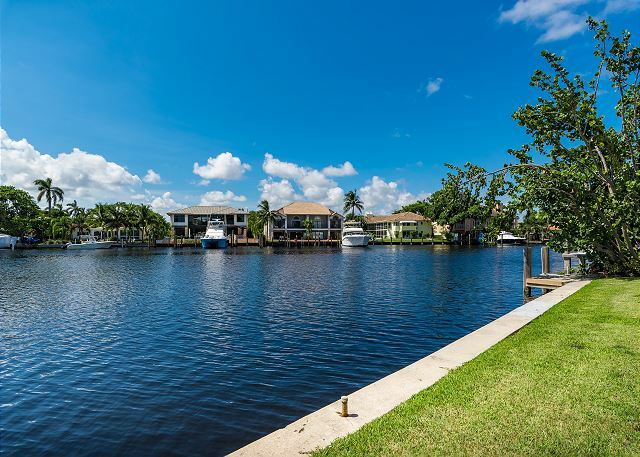 Check out the magical water views day or night. Vacation among multi-million dollar homes on a beautiful dead end street. You can easily ride your park to any of the two national parks and plan a picnic for the day. Witness the spectacular sunsets every night of the week when looking west. Walk over the bridge to the ocean or cross the street and shop at the Galleria Mall with all upscale shops. 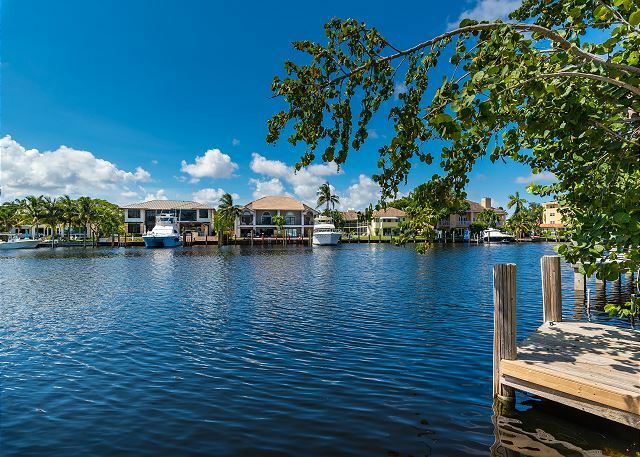 Bring your fishing rod and sit on the 11' dock as you hook a grouper or dock your boat after cruising the Waterways. 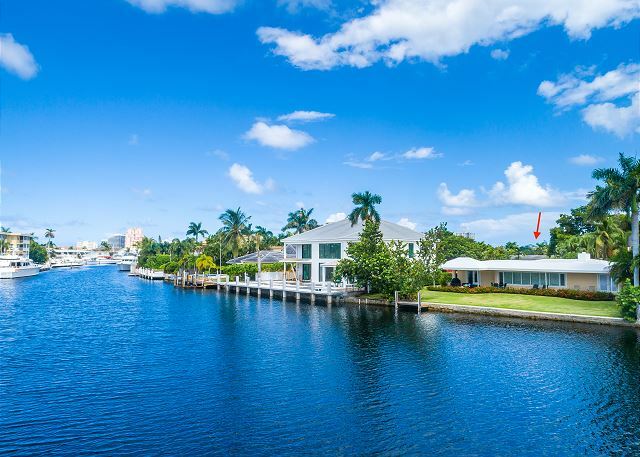 This vacation home has it all! 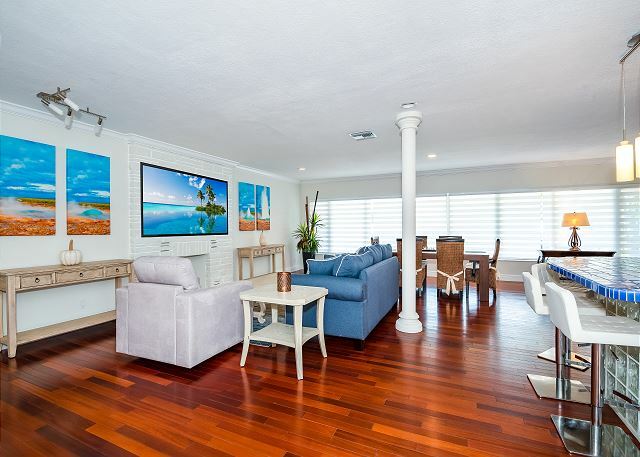 As you enter the front door, you'll love the beautiful water views and be impressed with the imported wooden floors throughout. 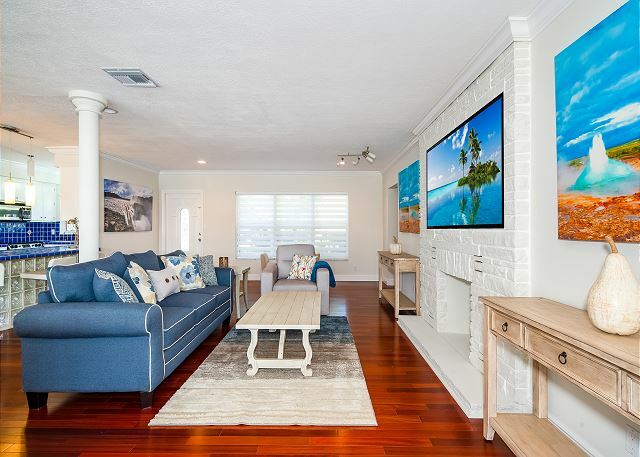 Relax in the "Tommy Bahama" style lounger and enjoy your favorite late night shows on the 50" flat screen TV sitting above the elegant brick fireplace. Take a snooze on the comfortable sleeper sofa for two. A full marble bathroom is steps away and shared with the third guest bedroom. 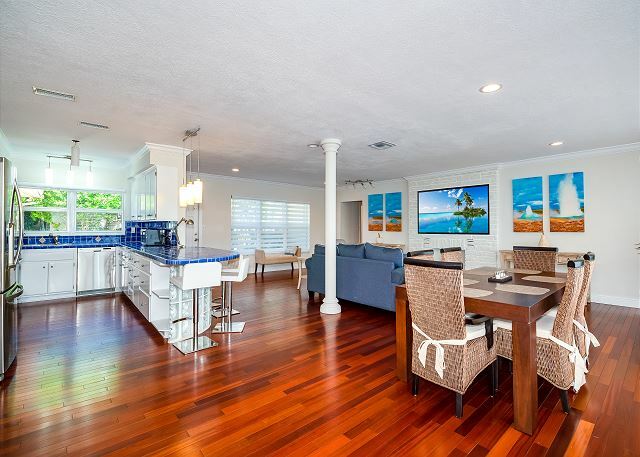 The dining area overlooks the water thru oversize picture windows and has an elegant wood table that easily seats 6 for elegant or casual dining. 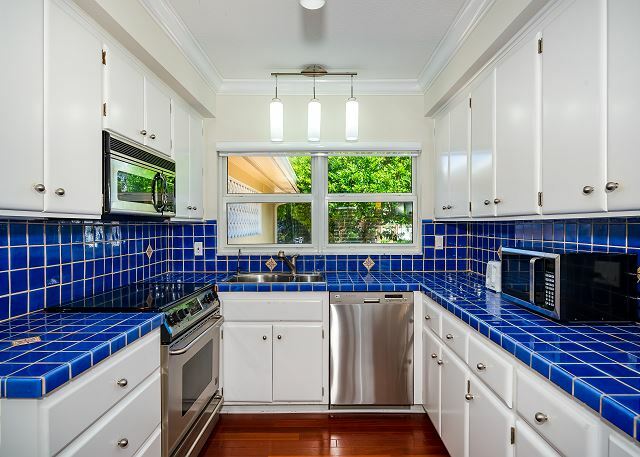 Perfect for large or small groups, the kitchen comes complete with stainless steel appliances, tile counter tops and double stainless steel sink with a window above for admiring the outside lush landscaping, The breakfast bar for four is perfect for sipping wine or tasting appetizers before dinner. 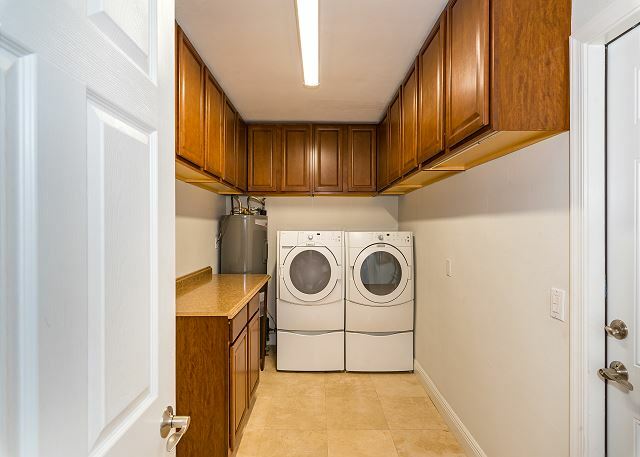 The laundry room is next to the kitchen with state-of-the-art washer and dryer. 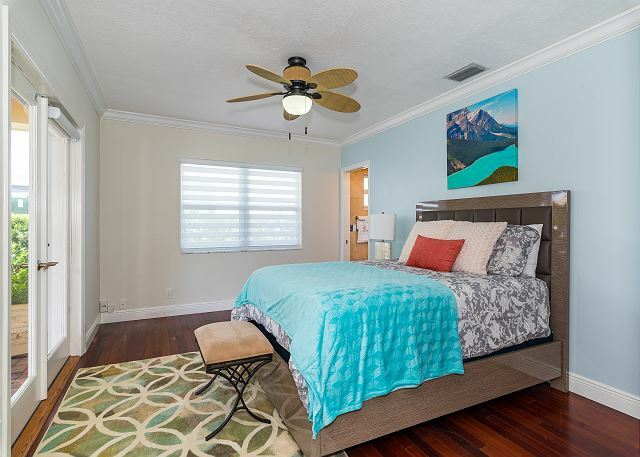 Designed with soft grey's and turquoise blue's to imitate the sky and water, the master bedroom comes with a plush queen size bed with high-quality linens. 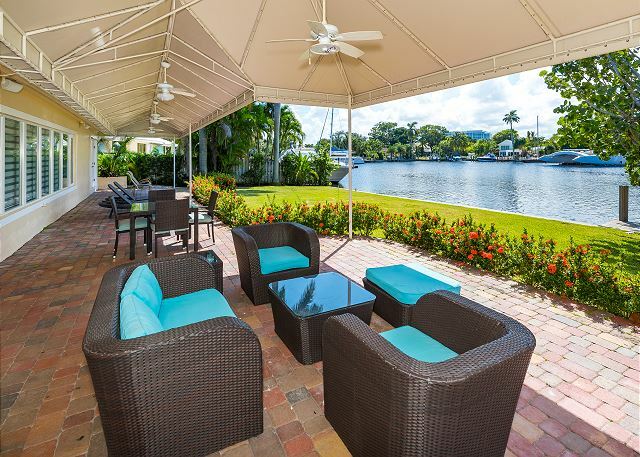 The double french doors allow for wonderful water views and lead you to the back patio. Store your personal items in a dresser drawer or in the two walk-in closets. Cozy up with your Kindle on a huge lounger ideal for two. Or pamper yourself in the en-suite master bath, with an elegant pedestal sink and a marble walk-in shower. 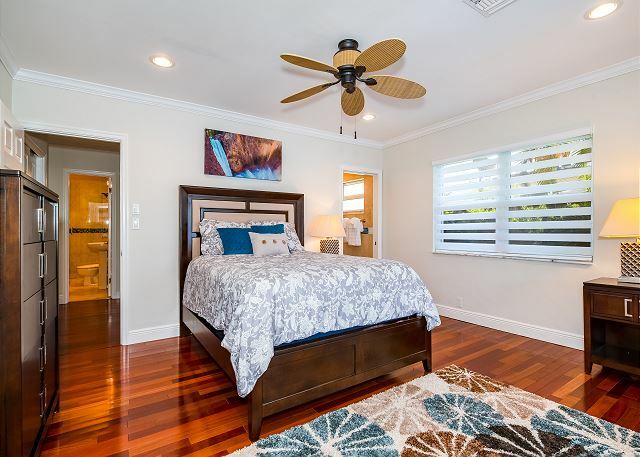 Off the main living area and thru the glass doors sits a junior master suite where you can rest soundly in a comfy queen bed with french doors looking over the water. 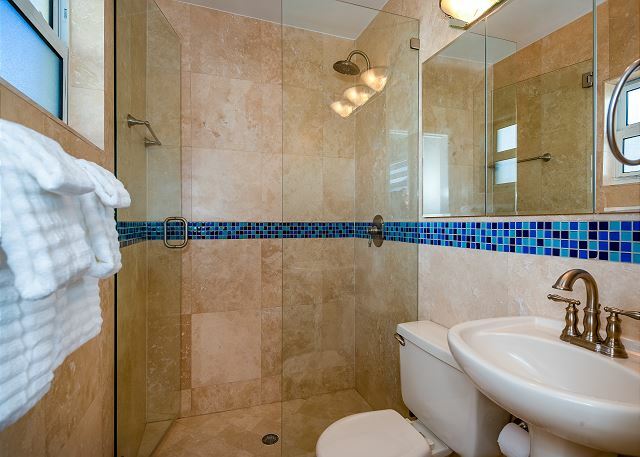 Decorated in tones of blue, the en-suite bathroom has a marble walk-in shower, elegant pedestal sink, and large mirror. Off the living room area is the third guest bedroom with bunk beds with two full-size mattresses that can easily sleep four. 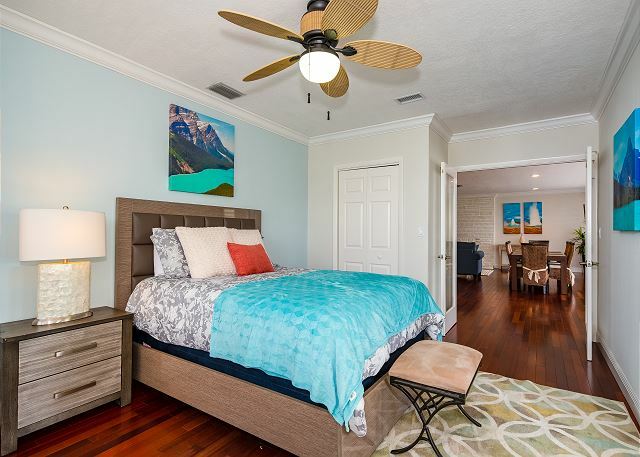 Perfect for kids of all ages, this bedroom has a large dresser and a walk-in closet to store your luggage. 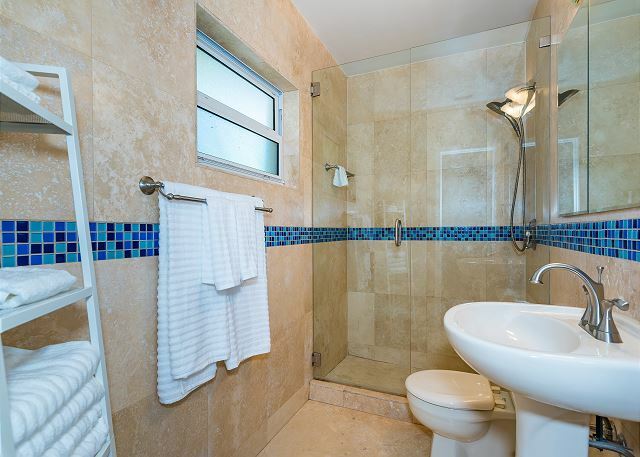 Outside your door in the hallway, you will find the luxury marble bath and walk-in shower. Outside the front door is a patio with planters. 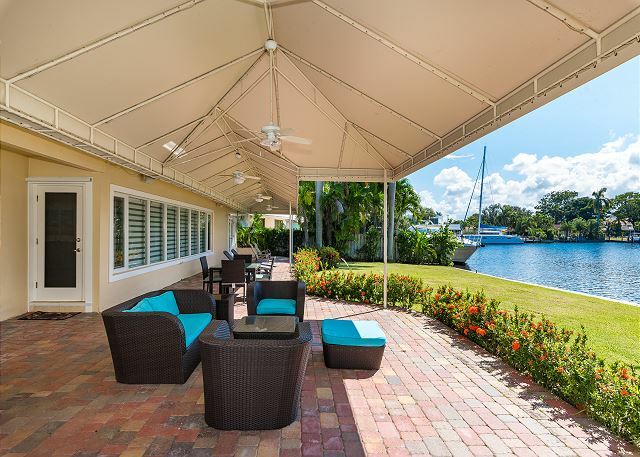 Spend a relaxed day under the covered back patio admiring the 300' feet of water with mega yachts passing by. Grill your favorite fish and dine outside al-fresco. 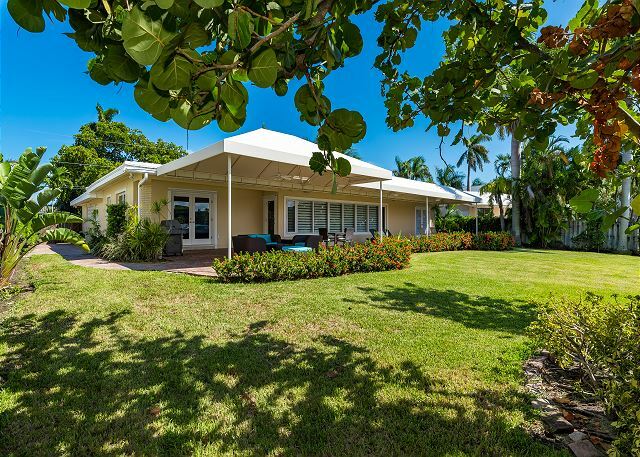 Then enjoy a midnight cap under the stars while relaxing in the outdoor seating areas. 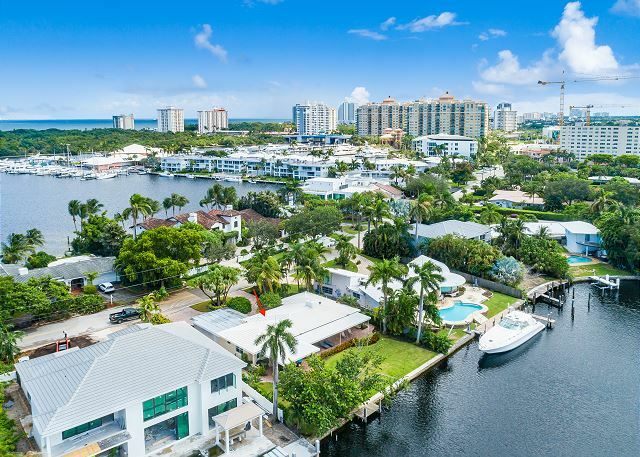 When you’re ready for sand and surf, walk four blocks across the bridge to the Ft. Lauderdale Beach. 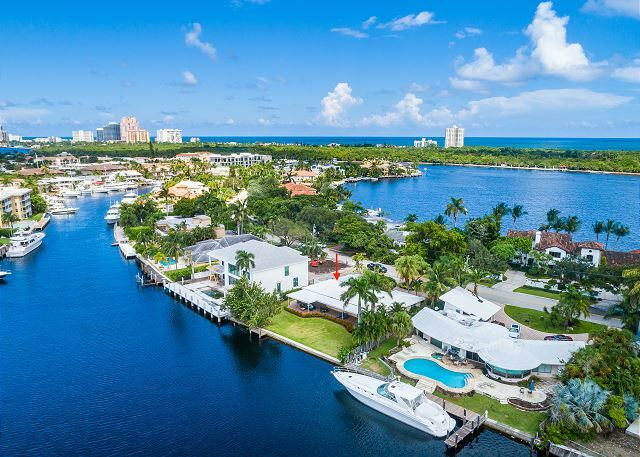 Deerfield Beach (15 minutes) and Hollywood Beach (20 minutes) are also popular stretches of sand for swimming and water sports. Two blocks away is the famous Galleria Mall with fine shopping including Dillard's and Macy's. There, you can catch happy hour at Blue Martini or PF Chang's. For more exercise, ride your bike to the grocery store or stroll thru two national parks nearby. Take the night off and head to Casablanca Restaurant or walk along A1A to one of the nearby oceanfront restaurants and pubs. Ft. Lauderdale Beach has it all. Sun. Fun. Weather. Water. 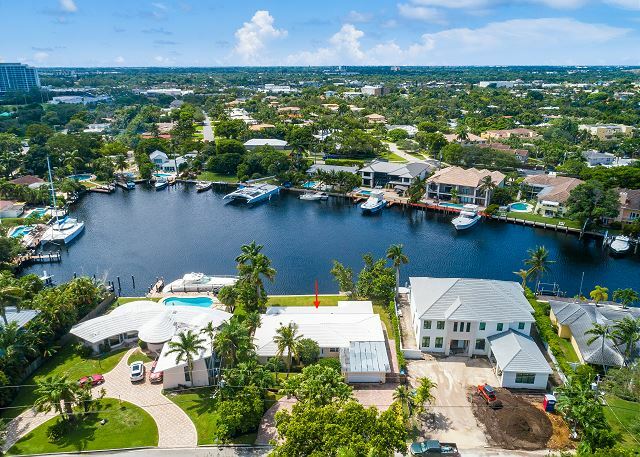 You can play tennis at the nearby public tennis courts or the kids can shoot hoops at the city park just a few blocks away. 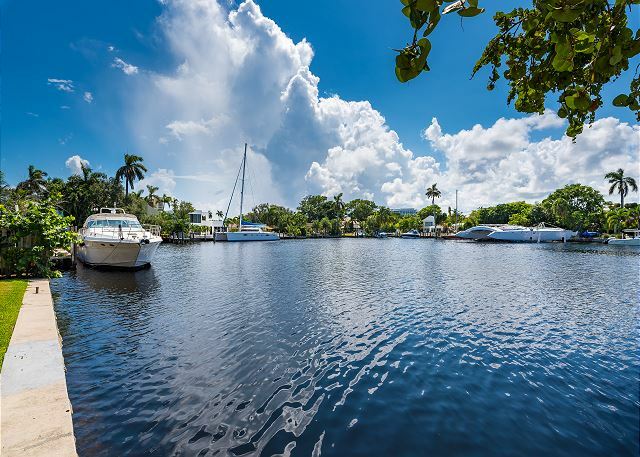 Ft. Lauderdale is home to several marinas for fishing, boating, and snorkeling excursions. 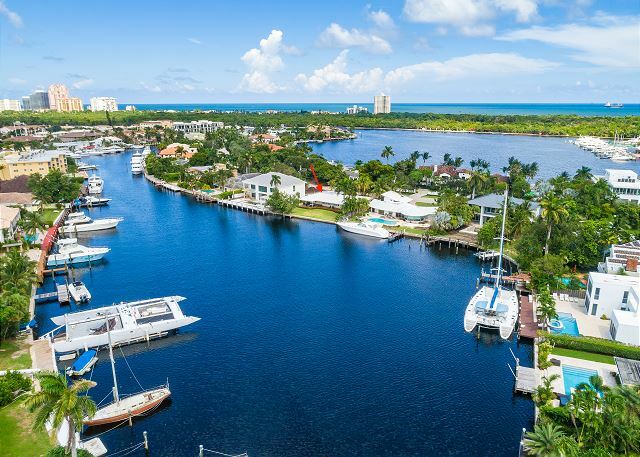 Don't forget to visit Las Olas where you'll find upscale boutiques and an exciting night life. Note: Pack 'n play portable cribs and high chairs are available upon request.